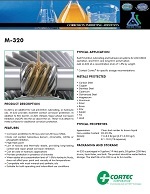 Description: M-320 is an additive for rust preventive, lubricating or hydraulic oils. M-320 provides excellent contact corrosion protection. In addition to this film barrier, M-320 releases vapor phase corrosion inhibitors into the air above the oil. These VCIs attach to metal surfaces for additional corrosion protection. Package: 5 gallon (19 liter) pails and 55 gallon (208 liter) drums, liquid totes and bulk.